Having a large current account deficit relative to a country’s gross domestic product (GDP) has often been viewed as making it more vulnerable to “sudden stops" or reversals in foreign capital inflows. In 2013, investment bank Morgan Stanley termed Brazil, India, Indonesia, Turkey and South Africa the “Fragile Five", due to their relatively large current account deficits (see Chart 1), which were accompanied by slowing growth in some cases (Brazil, India and Turkey) and high fiscal deficits in others (India and South Africa). The need to finance their current account deficits left these countries exposed when foreign investors panicked after the then US Federal Reserve chairman Ben Bernanke signalled tapering of the Fed’s quantitative easing (QE) programme on 22 May 2013. The Indian rupee suffered the largest decline among the Fragile Five, depreciating by 23.5% to 68.8 against the US dollar by end-August 2013. The Fragile Five have reduced their current account deficits to various degrees in subsequent years (see Chart 1). India reduced its deficit from nearly 5% of GDP in 2012 to less than 1% in 2016. India’s current account deficit widened to 2.4% of GDP in the first quarter of the current financial year, but remains well below the level reached in 2012. As a result of improvement in macroeconomic fundamentals, the Indian rupee remained fairly stable when the Fed tapered its QE programme between December 2013 and October 2014. Reactions to the first US Fed rate hike in December 2015, and subsequent increases in December 2016, March 2017, and June 2017 were also muted. Macroeconomic theory suggests that current account deficits have a counterpart in saving-investment imbalances—a deficit usually arises when domestic savings fall short of investment. An implication is that capital should flow from countries with surplus savings to those where domestic savings are not keeping pace with domestic investment. The former group includes countries with crude oil resources, such as the Gulf Cooperation Council (GCC) countries, as well as countries running large trade surpluses stemming mainly from manufactured exports, notably China and Germany (see Chart 2). 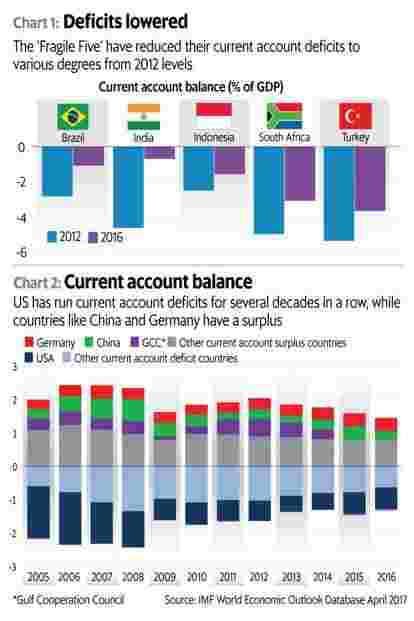 The latter group includes the US, which has mostly run current account deficits for several decades in a row. This benefit is conferred by the privileged status of the US dollar as the world’s main reserve currency, as pointed out by economist Robert Triffin in his critique of the central role of the US in the international monetary system. Developing countries with investment opportunities and need for external financing also tend to run current account deficits. Similar to current account deficits, large current account surpluses can also become problematic in certain circumstances. The recycling of petro dollars by the oil-rich West Asian countries with large surpluses was linked to the Latin American debt crisis in the early 1980s. The global imbalances in the 2000s arising from China’s large surpluses (and corresponding deficits of the US) were also blamed for loose liquidity conditions in the US, which, among other factors, fuelled a housing market bubble and eventual bust in 2006-07. China’s large and persistent current account surpluses that have allowed it to accumulate foreign exchange reserves of about $3.1 trillion have been criticized (fairly or unfairly) as arising from “currency manipulation" or policies to maintain an artificially-undervalued exchange rate with the aim of promoting exports. More recently, Nobel Prize-winning economist Paul Krugman has argued that Germany’s large trade surpluses, and the associated excess savings of German households, may have acted as a drag on the rest of the euro zone economy. Countries running large and persistent current account surpluses such as China and Germany also face economic costs, including relatively low yields on foreign (typically US and European) government bonds held as part of their foreign exchange reserves, and possible currency appreciation that can harm future exports. Current account surpluses and deficits will continue to be part of an interconnected global economy, given differences across countries in savings rates, demographics, levels of development, productivity, and investment opportunities. However, a persistent current account surplus that results from an undervalued currency may require policy actions aimed at moving towards fully flexible exchange rates and promoting domestic demand. Developing countries that usually run current account deficits also need to take proactive policy measures, given the fickle nature of foreign portfolio capital. These can include building an international reserve cover, prudential regulations to prevent asset price bubbles from large capital inflows, measures to attract longer-term foreign direct investment, and implementing capital account liberalization in a manner consistent with the level of sophistication of the domestic financial sector. Sanket Mohapatra is a faculty member at the Indian Institute of Management, Ahmedabad. This article presents the author’s personal views and should not be construed to represent the institute’s position on the subject.